NIACL AO Interview Call Letter 2019 is Out…..!! 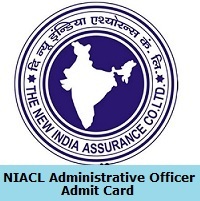 The NIACL Administrative Officer Admit Card 2019 released by the New India Assurance Company Limited authority on 28th March 2019 at the official website. Candidates who had applied for 312 Administrative Officers (Generalists, and Specialists) vacancies, they should attend for the AO Interview from 8th April to 22nd April 2019 (08.30 AM) along with NIACL AO Interview Call Letter 2019. The interview call letter will be available on the official site from 28th March 2019 to 22 April 2019. So all the competitors keep it remember and attend for the test along with NIACL AO Call Letter 2019. Candidates should download the NIACL Administrative Officer Admit Card 2019 from this page by hitting on the below given link. The NIACL Administrative Officer Admit Card 2019 plays an important role at the time of the examination. The management of the examination will not allow the candidates into the examination hall without NIACL Administrative Officer Admit Card 2019. The New India Assurance Company Limited (NIACL) officials are going to conduct the NIACL Administrative Officer main Examination on 2nd March 2019. For this purpose, the officials released the NIACL Administrative Officer Admit Card 2019. To download the hall ticket from the official website, candidates have to provide the login credential information. The New India Assurance Company Limited (NIACL) higher authority will conduct the following selection rounds to select the candidates for the Administrative Officer vacancy posts. To Download NIACL Administrative Officer Admit Card 2019 from the official website, candidates need to use the following details. The NIACL Administrative Officer Admit Card 2019 contains information about the examination and applicant related information. Candidates need to carry any one of the documents from the below given list at the time of attending the written test along with NIACL Administrative Officer Admit Card 2019. The NIACL officials are going to conduct the NIACL Administrative Officer Interview from 8th April to 22nd April 2019. The NIACL Administrative Officer Interview Call Letter 2019 is available now to download. Candidates just give a single click on the below given link and download the Admit Card. First of all, candidates log in to the official website of NIACL at newindia.co.in. New India Assurance Company Limited main page will open. Find the NIACL Administrative Officer Admit Card 2019 link in what’s a new section. Enter all the important details in the required fields and submit them. As per given info, the NIACL Administrative Officer Hall Ticket will open. Candidates who want to know more details about all government job recruitments, syllabus, previous papers, admit card and result, they should bookmark Sarkari Naukri by pressing Ctrl+D. Thank you.